In addition to my Twitter client1, Nuzzel is the other Twitter-based app I use every day, whenever I have a moment to check the news. With version 2.0, launching today for iOS, Android, and the web, the team at Nuzzel is hoping to expand the scope and utility of the service beyond Twitter and tweets from the timeline, with new ways to provide content to logged out users and discover articles inside the app. I first came across Nuzzel in the summer of 2014 when I was on vacation, and I've been using it since. Nuzzel takes a look at links shared by the people you follow, counts them up over a period of time like, say, the last 8 or 24 hours, and it shows you a list of the most popular links that people you follow have been talking about. If you want, you can see what friends of friends are sharing, you can see how people share it (what they say in their original tweets), and you can receive a push notification when a link exceeds a certain threshold of shares in your timeline. Nuzzel is a fantastic way to catch up on Twitter without the annoyance of scrolling your timeline, and it's great to catch links that are about to become popular in your network. I still can't believe Twitter hasn't bought Nuzzel and integrated it into their mobile app, but here we are today. The Nuzzel team isn't stopping, which is good news for people like me who depend on it. The big change in Nuzzel 2.0 is twofold. First, you can use the app without logging into Twitter or Facebook. This will obviously prevent you from viewing a stream of shared links from your timeline, but you'll still be able to discover and subscribe to content feeds, which is the other major change in this release. Nuzzel is moving beyond being a simple aggregator links shared in your timeline or someone else's timeline to provide search and discovery for feeds (powered by Twitter lists) and individual articles. In the app's new Discover section, you'll now find feeds for news about tech, gaming, sports, fashion, climate change, the American elections – you name it. These feeds are based on Twitter lists, but, unlike Twitter's forgotten product, tweets inside them are ranked with Nuzzel's engine – by shares and time range. If, for instance, you come across a list that aggregates tweets from 1000 users, Nuzzel won't show you all those tweets; it'll only show you the most popular links from those tweets – the ones shared by the most people – and you'll still be able to filter tweets by time and subscribe to push notifications. After testing Nuzzel 2.0 for the past couple of days, comparing what the company has built to Twitter's appalling implementation of lists is, frankly, quite embarrassing for Twitter. 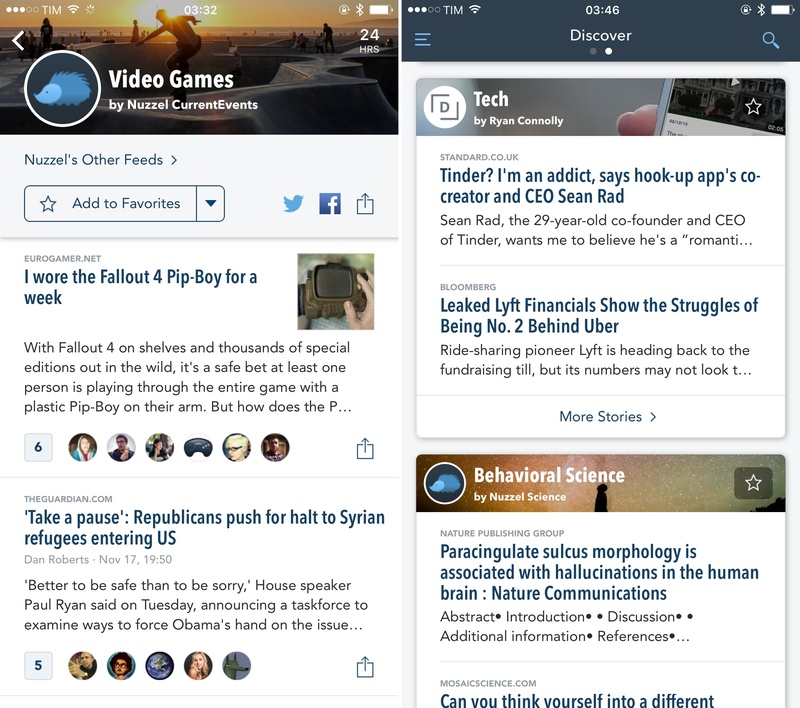 In Nuzzel, feeds are first-class citizens: they can be sorted and subscribed to, and if you mark one as favorite you'll be able to swipe to it from the main screen, so you can switch to a topical feed in a second. I've enjoyed the ability to subscribe to feeds that are related to my interests but powered by people I don't follow: I have subscribed to a Tech feed curated by Nuzzel Tech that aggregates general tech news, and I've also marked Video Games as a favorite to stay on top of gaming media outside of my primary interest for Nintendo. If this sounds like Nuzzel is trying to be more like Apple News and Flipboard, it's because, on paper, this is kind of what they're trying to do – giving users ways to discover news and topics they like without the burden of curating their own sources and lists. But there's a unique twist here: unlike most social magazines and news aggregators, Nuzzel hasn't been designed to overwhelm you with as much content as possible. The app doesn't aggregate every single tweet from your timeline only to make it nicer to look at. Nuzzel doesn't semantically analyze and categorize content either. Everything in the app is based on two parameters: people who share links, and how many people have shared a specific link within a given time period. In my tests with feeds discovered from Nuzzel's new section, I noticed a good selection of actual human beings (not websites or bots) tweeting about specific topics, suggesting that Nuzzel has been preparing for this launch by doing their own curation of broad topics in Twitter lists. Indeed, founder and CEO Jonathan Abrams confirmed to me that, to demonstrate the platform in the short term, they have created "a few hundred feeds on various topics"; they're expecting all feeds to be created by experts in a field, media companies, and other organizations in the future. I wonder if this is where Nuzzel's monetization plan lies down the road. Search results in Nuzzel could use better ranking and filters. Based on what I've seen so far, feeds created by Nuzzel show solid curation skills on their end, but discovery may still be a problem if the company doesn't find ways to surface only the best feeds or articles about a topic. When searching for a feed, I found results for user-created lists that had been hastily put together and often featured one or two sources tweeting about a topic. Should I really be able to view these feeds and subscribe to them when they offer little value in return? And if I'm searching for articles, how are results ranked? They're not sorted by date, but they don't seem to be ranked by shares either, which makes the resulting screen look confusing and not in line with the rest of the app. Also, the app runs in upscaled mode on the iPad Pro and doesn't support iOS 9 multitasking, which should be fixed. Overall, Nuzzel 2.0 does a good job at not fixing what isn't broken, keeping the focus on summarizing important links shared by people you trust and notifying you of articles that may be relevant to your taste. 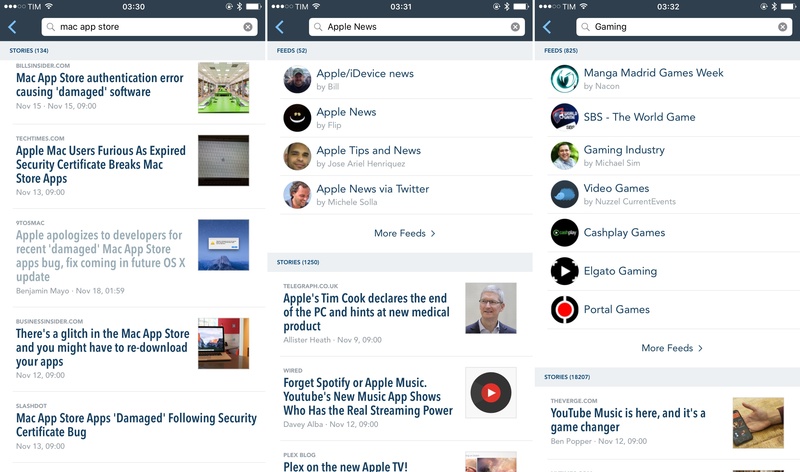 The core part of the app is unchanged, and now it can be expanded to include articles from standalone feeds, which work the same way and are easily accessible. Nuzzel continues to be my favorite way to see what's happening on Twitter at a glance, and it'll be interesting to see how feeds and search will grow from here. 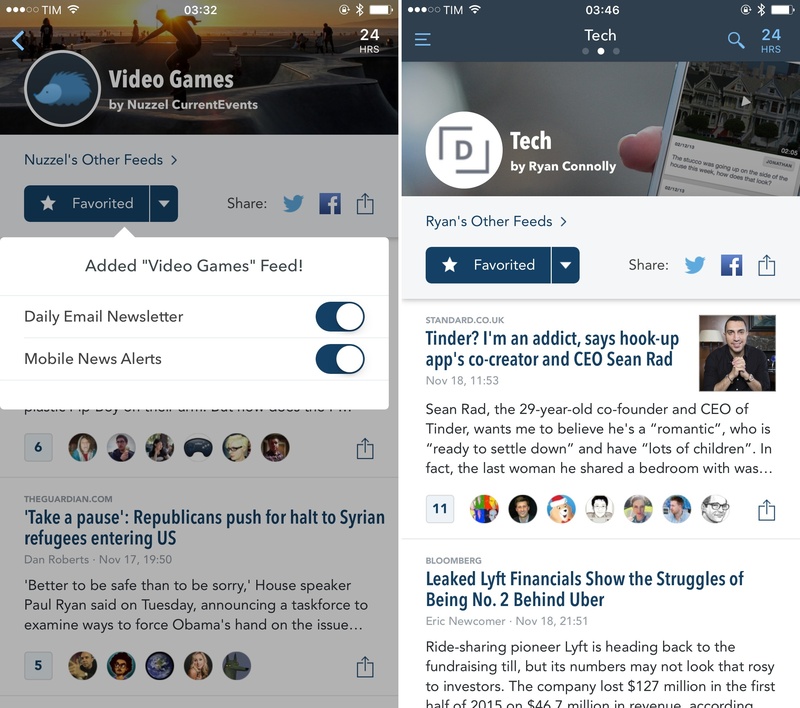 Nuzzel 2.0 is available on the App Store.